Update 9/23. According to TASS, Mustafina is now officially one of the seven named to the provisional team with Sosnitskaya no longer considered the number one alternate choice. Following the 2015 Russian Cup, the women’s national program coaching staff have named the six gymnasts currently expected to compete at World Championships in Glasgow, Scotland this October. This is an incredibly experienced team, with Tutkhalyan the only one who hasn’t competed on a major international stage like Worlds or the Olympics in the past. Despite her issues this week, she has proven to be reliable in international competition otherwise this year, putting in solid performances at the European Games and at a friendly meet in Italy. In terms of the specialists, Komova will stick with bars and beam, Paseka will do vault and bars, and Afanasyeva will handle vault, beam, and floor. In this scenario, they have only four options on floor, meaning all four would have to hit in the five-up four-count qualifications format, though Paseka did show quality work on that event this week so with Komova still not back on the event, it’s likely she’ll compete there as well. Though we reported Friday that Aliya Mustafina will be sitting this year out due to back pain limiting her training over the past couple of months, the Olympic champion seems to have had a change of heart only days later. Mustafina, meanwhile, told R Sport that she has not yet made a final decision and everything will depend on her health. With her injuries causing her to miss training, it’s likely that being out of shape will be more of a hurdle than the pain itself, but she’s looking forward to getting back in shape at Round Lake, where she will begin training again this week to see if such a fast turn-around is possible. It’s questionable whether any gymnast – let alone a 21-year-old dealing with injuries – can return to competition shape with just a month before Worlds, and neither she nor the Rodionenkos sounded fully convinced that it will happen…though with the mistakes and falls from the Russians in Penza this week, it’s clear why everyone is hopeful for the return of their consistent leader. September 20, 2015 in Aliya Mustafina, Alla Sosnitskaya, Breaking News, Daria Spiridonova, Ksenia Afanasyeva, Maria Kharenkova, Maria Paseka, Russia, Seda Tutkhalyan, Viktoria Komova. I think with Aliya there, their chance of TF silver significantly improved and she might just have to do only beam and fx in TF. If she’s really up to it she can do all 4 in qual and then maybe try for AA and EF also. 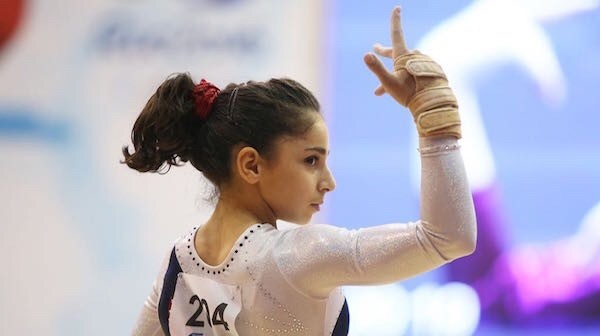 But really, they could use her on beam and fx as well as being the leader…. Lauren, Do you know when it was she stopped or cut back on her training? Also, do you know more about the injury itself? Thanks! I can’t wait for worlds and the unfolding of this story is one of the reasons! Any thoughts on who Mustafina would replace on the team if she did make it back? I was thinking Komova or one of the all arounders but it’s hard to know especially when we don’t know if she’d be focusing on a certain event. Can’t wait for Worlds! I think its somewhat ridiculous for Aliya’s coaches to even allow her to attempt this, knowing that shes in pain. All gymnasts train/compete with pain, i get that. But allowing her to push herself at this point is too much of a risk. Yes, the Russains are going to have a miniscule chance at a TF medal without her at Worlds, but look at the bigger picture. Break her down anymore now than she already is, they’re jeopardizing even more for next year. I think Aliya is a beautiful gymnast and personally i love her fiesty personality, but I’d rather see her HEALTHY in 2016 than struggle and get further injured now. Floor 14.7 14.1 14.1 Afan Paseka Kharenkova . Total 177 . I have not seen any high scores in other nationals outside of the US . I honestly don’t know how they will perform in Glasgow but with Paseka & Afan & Spriridinova they do have 3 steady gymnasts , 2 with some lesser international success this year ( but still successes) & one wobbly but possible world champ . You have to take a chance on Komova’s bars . ( I don’t think they will use her on beam ) but reserve vaulter maybe . They’ve got a cushion of 10 falls . Given their consistency I would be more conservative and use the average for all routines not just best 2 score average during this weekend. 177 would be like almost best scenario with everyone hitting. I did one for the 4 count on the AA day alone ( plus the few events Afan & Paseka not contest eg beam floor from team ) & the total came to 233. if you want to use Day One which was considered dreadful it would still be 228 + thus qualify to Rio . Paseka & Afan ( from teams) Seda 15.4 14.6 14.5 . Afan Paseka kharenkova. 14.7 14.1 14.1 . All in all not too bad & if they take Mustafina for their confidence will rise. Mustafina can always do a 14 .on any event .. She doesn’t have to lose any weight & 4 weeks should tune her Upfor reserve . Oh, the Russian drama machine…roaring to life yet again.